How to configure the gaming option on D-Link DGL-4100 DGL-4300 or DGL-4500 Router? 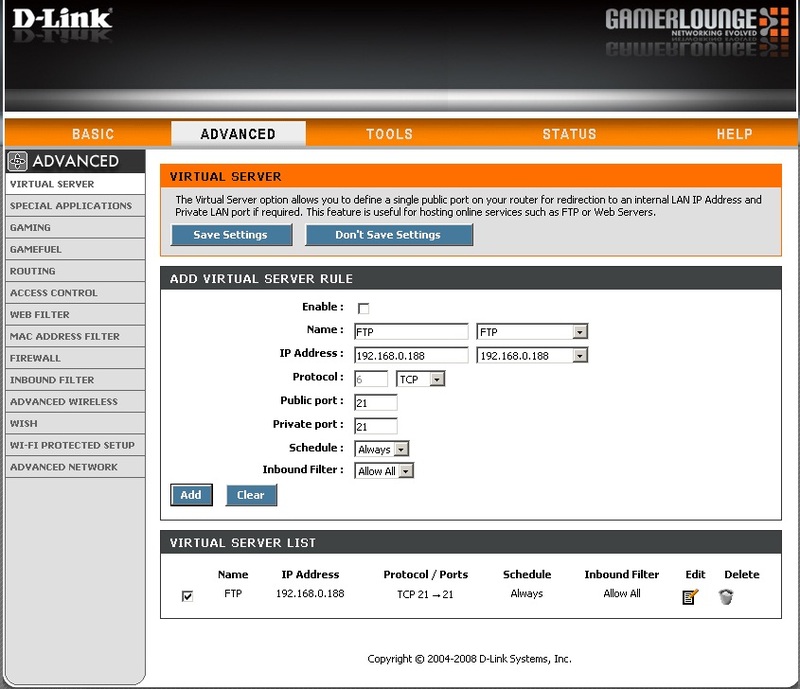 The Gaming (port forwarding) option allows you to open ports and forward them to an IP address on your LAN. Step 1 Open a web browser and type the IP address of the D-Link gaming router in the address bar (default is 192.168.0.1). Press Enter. Step 2 The default password is blank (nothing). Click Log In. Step 3 Click Advanced at the top and then click Gaming on the left side. Name – Enter a name to identify the rule or select one using the drop-down list to the right. IP Address – Enter the IP address of the computer on the LAN that traffic will be forwarded to. Step 5 Click Save to add the new rule. How to Connect Using WCN 2.0 in Windows7 on D-Link DGL-4500 Router? The router supports Wi-Fi protection, referred to as WCN 2.0 in Windows 7. The following instructions for setting this up depends on whether you are using Windows Vista® to configure the router or third party software. When you first set up the router, Wi-Fi protection is disabled and unconfigured. To enjoy the benefits of Wi-Fi protection, the router must be both enabled and configured. There are three basic methods to accomplish this: use Windows Vista’s built-in support for WCN 2.0, use software provided by a third party, or manually configure. If you are running Windows Vista®, log into the router and click the Enable checkbox in the Basic > Wireless section. Use the Current PIN that is displayed on the Advanced > Wi-Fi Protected Setup section or choose to click the Generate New PIN button or Reset PIN to Default button. If you are using third party software to set up Wi-Fi Protection, carefully follow the directions. When you are finished, proceed to the next section to set up the newly-configured router. 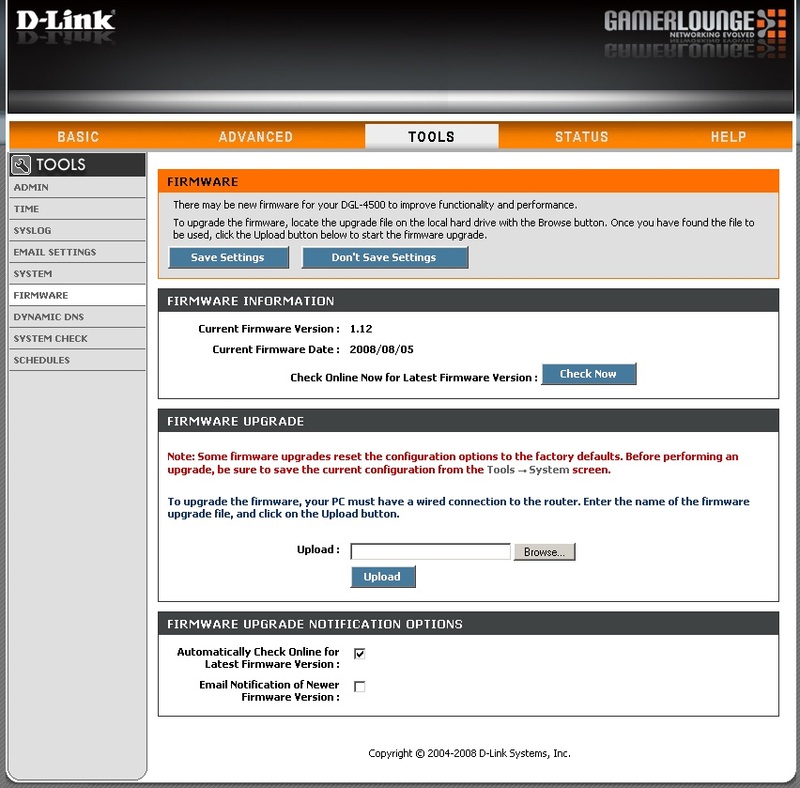 You can upgrade the firmware of the D-Link DGL-4500 Router here. Make sure the firmware you want to use is on the local hard drive of the computer. Click on Browse to locate the firmware file to be used for the update. Please check the D-Link support site for firmware updates at http://support.dlink.com. You can download firmware upgrades to your hard drive from the D-Link support site. Click on Check Online Now for Latest Firmware Version to find out if there is an updated firmware; if so, download the new firmware to your hard drive. After you have downloaded the new firmware, click Browse to locate the firmware update on your hard drive. Click Upload to complete the firmware upgrade. Check Automatically Check Online for Latest Firmware Version to have the D-Link router check automatically to see if there is a new firmware upgrade. Check Email Notification of Newer Firmware Version to have the router send an email when there is a new firmware available. The D-Link DGL-4500 can be configured as a virtual server so that remote users accessing Web or FTP services via the public IP address can be automatically redirected to local servers in the LAN (Local Area Network). The D-Link DGL-4500 firewall feature filters out unrecognized packets to protect your LAN network so all computers networked with the DGL-4500 are invisible to the outside world. If you wish, you can make some of the LAN computers accessible from the Internet by enabling Virtual Server. Depending on the requested service, the DGL-4500 redirects the external service request to the appropriate server within the LAN network. The DGL-4500 is also capable of port-redirection meaning incoming traffic to a particular port may be redirected to a different port on the server computer. pre-defined virtual services already in the table. You may use them by enabling them and assigning the server IP to use that particular virtual service. Check this box to enable the rule. Enter a name for the rule or select an application from the drop-down menu. Select an application and click << to populate the fields. Enter the IP address of the computer on your local network that you want to allow the incoming service to. If your computer is receiving an IP address automatically from the router (DHCP), you computer will be listed in the “Computer Name” drop-down menu. Select your computer and click <<. Select TCP, UDP, or Both from the drop-down menu. Private Port/Public Port: Enter the port that you want to open next to Private Port and Public Port. The private and public ports are usually the same. The public port is the port seen from the Internet side, and the private port is the port being used by the application on the computer within your local network. Schedule: The schedule of time when the Virtual Server Rule will be enabled. The schedule may be set to Always, which will allow the particular service to always be enabled. You can create your own times in the Tools > Schedules section. Select Allow All (most common) or a created Inbound filter. You may create your own inbound filters in the Advanced > Inbound Filter page. Note:Do NOT upgrade firmware on any D-Link product over a wireless connection. Failure of the device may result. Use only hard-wired network connections. This firmware is engineered for North American products only.Using this firmware on a device outside of North America will void your warranty and may render the device unusable. ¤ Added: More help description for Advanced DNS feature. ¤ Added: Schedule feature supports 12 and 24 hour format.